My daughter models her new winter coat. Okay…I know technically last week was the last View for 2008 but since I never did go back and replace View 1 with a photo, this is really the 52nd View with a photo. 🙂 This photo demonstrates a couple of things I tell people when they ask me how to improve their photos. One, fill the frame! If I included the room where she is wearing the coat, you’d probably miss her beautiful smile. Two, framing as the coat’s fake fur does around my daughter’s face. 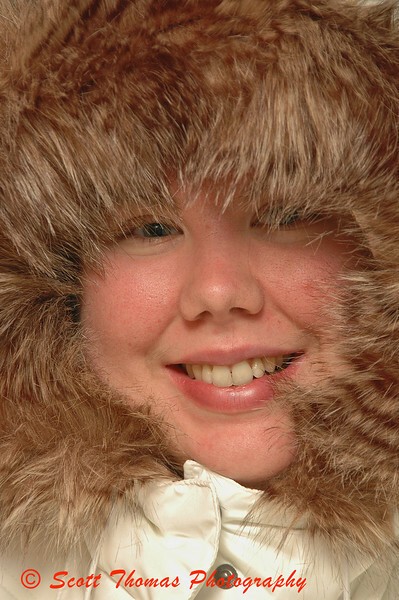 This entry was posted in People, Weekly View and tagged coat, daughter, family, Photography, winter. Bookmark the permalink. Very nicely framed picture, and well captured. You can tell how happy she is to finally have found THE coat! I’m curious, do you crop your pictures in-camera, or afterwards? I used to alway fill the frame in-camera (thanks to the old film days) but now remind myself to leave a little room for cropping – depending on who or what I photograph. This was cropped in the camera. I tend to forget to leave room for cropping later from my wedding photography days. What I try to do is shot a few photos now with various angles and framing. Since most of my shooting is for the web, I normally don’t worry about print ratios like 8×10 or 11×14. This does make a great shot. You caught everything needed for this photo to work. Looks like the coat will keep you kid plenty warm. Just added your blog to my list of favorites (see list on the right). Should have done that long ago as I really like your and Anna’s photography. Your daughters smile and happy eyes are the story at this photo, and you are telling it very clear with this framing. She is so sweet. Happy new year to you and your family, Scott. I has been great to se your photos, read your stories, and receive your comments. What a lovely, lovely picture! It’s so sweet!